This is the first of a two-part post on the Do’s and Don’ts to bring hitting and biting to an end. This post will discuss what to do for kids under the age of three. The next post will address what to do for children 3 and older. Parents are understandably concerned when their sweet, little one begins hitting and biting other children or Mom and Dad. Even worse than the pain inflicted is the worry that our once loving and compliant child may become habitually aggressive, or the preschool bully. While hitting and biting are rarely that serious, they should be nipped early before they turn into a pattern of behavior that’s much more challenging to correct. For kids UNDER the age of three, hitting and biting is more of a training issue than it is a “misbehavior.” To a frustrated toddler with limited vocabulary and few social skills, taking a bite out of Mom or Dad’s arm or hitting a playmate who refuses to give up a favored toy seems perfectly logical. Our job is to train the child for better behavior in the future without creating a payoff that may cause the hitting and biting to continue or escalate. DON’T spank or slap a child for hitting or biting. Doing so reinforces that hitting is okay and models exactly the behavior you’re trying to stop. DON’T punish. Our focus should be to help the child learn positive ways to manage their big emotions. Punishing the child or telling him he is “bad” or “naughty” only furthers his discouragement and makes future aggression more likely. DON’T worry about other opinions. Whether you are at a playdate or visiting your in-laws, focus on your child – not your reputation or others’ suggestions – while being respectful to those in the vicinity. DO supervise closely. Toddlers can be unpredictable, but you can probably tell when your little one is getting frustrated or tired. When that’s the case, end the play date or swiftly remove him from the situation before it escalates to hitting or biting. DO remain calm. It’s understandable to be upset when your toddler hits you or another child, but you’ll get better results by staying calm. When you get upset and raise your voice, it’s scary for your child, and tough for him to learn. He also gets a big dose of attention for a negative behavior, which only serves to reinforce it. If you are holding your child when he hits or bites, CALMLY put him down and gently hold his hands to prevent any more aggression. If the child hits someone else, make sure the other child is okay (while keeping yours close to you) and gently remove your child from the environment so you can help him calm his emotions without the distraction of others. DO calm your child. Help your child calm her body by practicing belly breathing, hugging, or even singing a little song – whatever helps soothe her. Your goal is to teach her she has the power to work through her big emotions without lashing out at others. DO practice the re-do. Once your child is calm enough, help your child figure out what he could do differently next time, then practice it. This gives your child an opportunity to learn more effective ways to handle those big emotions in the future. Be patient, however—emotions can be overpowering and these new habits and skills take time to learn. DO practice alternative strategies. Have pretend play dates with stuffed animals and encourage your child to practice what she can do when she gets frustrated, including walking away, asking for help or using her words to say how she feels. Being able to use these conflict resolution strategies in the heat of the moment won’t happen overnight, but practicing them early and often is the key. DON’T force the child to apologize. A toddler’s “I’m sorry’s” are rarely heartfelt. When he is calm, talk about what he can do to “make it right” or “make the injured party feel better.” Coloring a picture or demonstrating an act of kindness teaches your child to take responsibility for his actions and show empathy for the other person. It’s never too early to teach your child to work through emotions without hurting other people. In fact, it’s a theme that will recur throughout childhood. 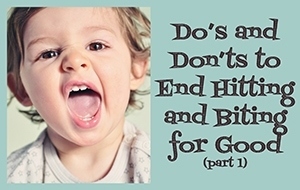 Head to Part 2 to learn the Do’s and Don’ts of hitting for children ages 3 and older.